The hotel lays in the very heart of Komarno, in the centre of all great happenings. Walking through the gates of the Hotel's entrance you will find yourself in a grand atrium summer terrace and a wide spectrum of services available to all our guests. Immediately the style and elegance of the hotel will search your attention. Banderium Hotel does not only offer great location in town, but guests will be treated with gorgeous views, comfortable stylish accomodations and a very pleasureful service. The hotel has 2 floors, with 11 double rooms and 1 suite, of which 3 are situated on ground floor to accomodate an easier reach for our guests. Some of the rooms also include own terraces with some nice panoramic views to the atrium life. The hotel also features a fine dining at Banderium Restaurant, a cozy bar and coffee/tea place in Atrium CofeeHouse and the largest 24 hour Casino in town with vast choice of entertainment. Just steps from the hotel our guests often find themself exploring the best bars, billiard salloons and pubs around the neighborhood. A small but important feature when you sleep through a few nights and have everything at your availability. Our locality is embraced by the largest shopping and business area of Komarno, and surrounded by a multiple line of Cathedrals, sports centers and tourist attractions. Our restaurant is located in the mediterranean style atrium right next to the hotel. With our menu we try to spot the perfect regional delicacies as well as some successes from international territories. We offer regional specialties from Hungarian and Slovak cuisine that can be interesting to our foreign visitors as well. Visiting guests can find excellent choices of various European meals in case their preference wishes to paddle the tastes of international waves. We are proud to present our meals to you up to the standards of today's requirements, at the same time we strive to maintain the traditional values of each meal. Preserving traditions is utmost important to us, but we like to mix new trends to our culture of service. Reserve your accommodation and Banderium Hotel Komárno will directly send their confirmation, the expected reply time is 16 minutes (guaranteed in 1 workday). Max. capacity: 4 persons: 2 adults and child(ren) under 2. 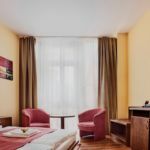 The rating of Banderium Hotel Komárno is 9.3 from the maximum 10, 20 based on actual and valid guest ratings and reviews. Based on the reviews and comments of actual guests, the services of the Banderium Hotel Komárno have received a high rating of 9.3/10.